Stirling Court Hotel provided the new home for the Scottish Disability Sport AGM this year, attracting a record attendance with around 150 athletes, coaches, volunteers, branch members, representatives from governing bodies all present to hear the work that SDS have been successfully undertaking over the last 12 months. SDS Chair Janice Eaglesham was elected into the position for another three years and carried out the formalities of the evening, while SDS CEO Gavin McLeod praised the incredible success of the Scottish athletes over the last year while highlighting the huge number of International events that Scottish athletes have attended. Events such as the IPC World Swim Championships recently held in Glasgow and the Special Olympic World Games held in Los Angeles over the summer months. Another International event where Scottish athletes excelled was the CPISRA World Games, held in Nottingham during August. The games were re-introduced after a 10 year break and Race Running coach and part of the Scotland coaching team for the event, Peter Drysdale gave an insight to the games. Peter has been instrumental in the development of Race Running in Scotland over the last couple of years and provided a background into the sport and the plan for the future while also touching on the development of the games. Formalities and presentations were followed by the annual awards ceremony, recognising the outstanding achievements of the athletes, coaches and volunteers across the country. This year, Lothian were extremely well represented amongst the awards with both athletes and coaches being recognised for the significant work and level of achievement they have produced over the last 12 months. Lothian Disability Badminton Coach Lyndon Williams was recognised with the SDS Plaque in recognition of support given to disability sport in Scotland while Lothian Phoenix coach Tina Gordon picked up the Russell Hogg Trophy for Development Coach of the Year. 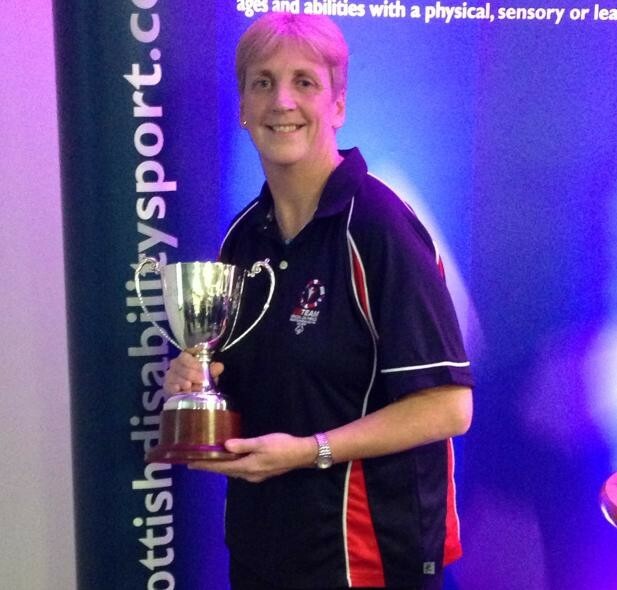 Elaine McKenna (Lothian Special Olympics) was recognised for her devotion to disability sport for the past 22 years, receiving the Elspeth Watson Trophy. Winning Wheels Wheelchair Tennis player Ruairi Logan was presented with the Russell Hogg Bursary to further support his development on the court. The Edinburgh based player has recently represented Great Britain at the World Cup in Turkey and finished runner up at the Sainsbury's School Games in Manchester a couple of weeks ago. This topped off a great evening for Lothian athletes and coaches and highlights the incredible work that is going on in the region through providing and developing opportunities to participate in disability sport.